The WEMPE NAVIGATOR II Series follows the successful design of the NAVIGATOR I Series, although it is presented in dark elegance. In order to do so, the massive aluminium casing was bead blasted and anodised pitch-black matt. The result are nautical instruments in a class of their own, which awaken desire in the hearts of passionate yachtsmen. Nobody can truly resist this series. 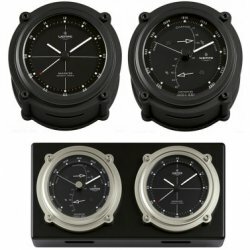 Get a piece of German workmanship on board or place the NAVIGATOR II instruments in your favourite spot at your office. Besides the battery-operated ship clock with quartz clockwork, the WEMPE NAVIGATOR II Series also includes a combination instrument. It unites a double chamber barometre, a thermometre and a hygrometre, so that air pressure, temperature and relative humidity can be measured at a glance. The values are presented on a black dial which has a diameter of 100 mm. The luminova markers are a special feature that ensure excellent legibility even at night.